I am an Emby Premiere subscriber and am running the latest versions of Emby server on my WD DL2100 NAS, and the Emby client on a LG TV and on a Windows computer. Any individual recordings I set will record just fine but series recordings do not record at all. I have tried changing the recording settings from recording new episodes only to recording all episodes but that does not help. Any series recordings that I set, regardless of whether new or previous episodes, show a white circle with a semi circle around it, which I am guessing means that it will not record. Any individual recordings that I set show a red circles and do record just fine. Also, none of the series recordings that I have set show up in the Schedule tab, even though there are upcoming new episodes shown in the Guide, but any individual recordings that I set do show on the Schedules tab. I am at a loss. I have attached a log file, as well as a screen shot showing the Emby Guide with shows set to record. Pretty Little Liars is set as a single episode, and Better Things is set as a series recording, with upcoming episodes shown, one of which is a new episode and the other an old one, The previously set Pretty Little Liars series recording previously set should have recorded earlier tonight failed to do so. I would appreciate any help in getting this to work as it's supposed to. Edited by mlweber62, 20 March 2019 - 11:38 PM. hi @mark-in-dallas, have you gone into the Series tab to check the settings for each series recording? There might be some restrictions applied such as only on a specific channel or time slot. Have you checked those? Hi Luke, I have checked all settings. I also noticed last week that TV series showing as scheduled to record show as red until the episode starts, then fail to record and turn gray, but if I also set to record that episode only in conjunction with the series recording it does record. I am also now thinking that it could have something to do with my AT&T Pace Gateway, as I have had numerous other problems with it and have now put it into pseudo bridge mode and connected my Linksys router behind it. I have a TV series that is supposed to record tonight and if it manages to record without intervention that will be proof enough for me that the gateway was the issue. I will come back and report tomorrow either way. That would be great information to know, let us know how you get on. Thanks ! Well bridging the gateway through my router did not help and the series recording I had set for tonight did not record. In the Guide it showed with the red circle with the semi-circle around it to indicate that it was a series recording and set to record it all the way up to the time that the recording should have started, but I opened Emby on my desktop a few minutes after the recording should have started and the Guide showed the program with a gray circle and semi-circle and the recording had not started, nor did it show in the Schedule or Recordings tabs. I've attached a screen cap of the series recording options and the Guide showing the recording grayed itself out, but I'm at a loss as to what the issue might be, any thoughts? Edited by mark-in-dallas, 15 April 2019 - 08:57 PM. I have attached the server log from today, as well as one that I believe to be from yesterday. I had a series recording set to record last night that did record. 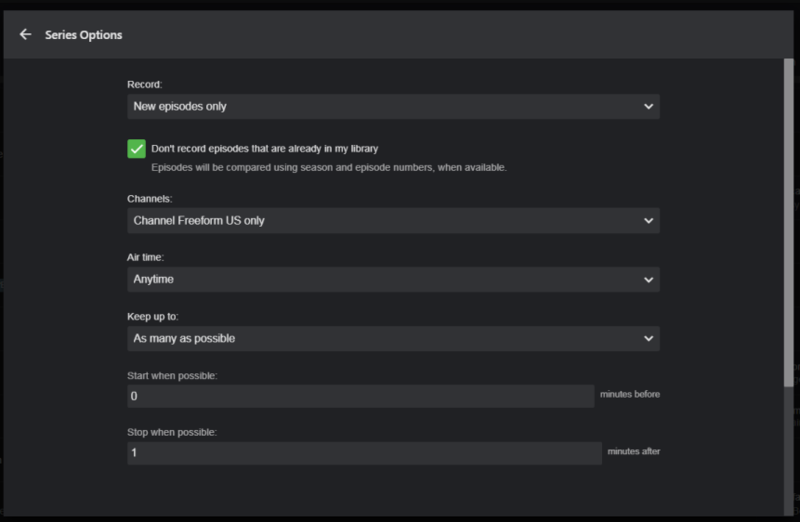 What I did before the episode started was to open the Emby Server using the Emby URL then click on the episode in the Guide and click the Do Not Record button, close out of the screen and refresh the page, click on the episode again and then click the Record button. I also left Emby open in my browser until after the episode recording began. I have another series recording set to record tonight and this time I will not make any changes in the Guide or leave Emby open, to see if that makes a difference. It does appear that if I cancel then reset a series recording, or at least cancel then reset the episode recording it will record, because doing so has worked for a couple of recordings, but I want to make sure before saying its definitely the case. 2019-04-16 19:00:02.257 Info App: Beginning recording. Will record for 61.9623671966667 minutes. I believe that was probably an episode of The Bold Type, which did record correctly, as did another series recording that was scheduled to record last night. I did have the Emby app open on my desktop computer at the time both recordings were scheduled to start recording though. I have 2 series that are scheduled to record for tonight though, and this time I will leave it alone and see if they do actually record. AT&T did give me an Arris BGW210-700 yesterday to replace their piece of garbage Pace 5268 gateway, which I promptly hooked up and placed in pass through mode, with everything running through my Linksys router. If the series recordings scheduled for tonight do record without incident it will be a pretty good indication to me that the Pace Gateway was the issue all along. I realize that a hardware gateway should not be able to affect software on other hardware, but one of the issues I was having with the gateway was that it would intermittently block access to the Emby Server installed on my NAS from all Clients, and when trying to log in from any Client device I would get the Select Server page, then when trying to connect to the NAS I'd get the "We're unable to connect" popup message, and I would have to reboot the gateway before being able to get Emby to connect.. Either way, I'l, come back and advise tomorrow.